A landmark of London opera returns this week when Jonathan Miller’s take on the Mikado returns to the English National Opera. As the Lord High Executioner Ko-Ko in this perennial favourite, Richard Suart has been involved with the role since 1986. He started out as understudy to Eric Idle but soon took over the mantle which has made him an operatic icon. One aspect looked forward to each year is Ko-Ko’s 'Little List' – a collection of contemporary targets which 'would not be missed'. Suart creates a new list for each run, and some of his selections have proved controversial in the past. We spoke to him about being Ko-Ko and who he has in the cross-hairs this time around. When you first started out in Jonathan Miller's production in 1986 and 1987, you were Eric Idle's understudy. How, as a trained singer, did it feel like to work with someone who was there presumably more for commercial than artistic value? Do you keep in touch? It was an enormous privilege. To a certain extent I was in awe of him, but I admired his approach to Ko-Ko enormously — he sang it well and took great care with the dialogue. I have sung subsequently with many actors and have discovered that they find conductors quite a challenge, especially within the discipline of a trio! He confronted all these issues well, indeed he is a musician, and therefore was an ideal piece of casting. And this may seem strange, but I never met him. Has your view of the character of Ko-Ko changed over the time you've played him? I think I have got to love him even more — he is a wonderfully naughty boy with a strong survival instinct. He gets himself into deep water frequently, but always manages to extricate himself — a tremendous optimist, and a serial flirter. Who could not fail to love him? The challenge for the performer, of course, is conveying all this, and I am sure that with age, my portrayal has mellowed, as indeed perhaps have I. You've spoken about, before going on stage, putting one copy of that night's 'little list,' in your jacket and another down your pants. Do you still do that? How open are you about the list's contents with the other cast and crew? The list goes in my shorts as I am parted from my jacket for 20 minutes. One can never be too careful. This patter singing is a cut-throat business! I test lines out occasionally on friends — the late Richard Angas always came to my dressing room before curtain up to be briefed on any changes. He would often sit in the wings during the number, and nothing pleased me more than to hear his roar of approval. I miss him in so many ways. Have you ever had to change a list after writing it due to changing circumstances or management concerns? I changed the list radically in 2001 in New York. This production was borrowed by City Opera and I went along too. We were due to open on 15 September which, indeed, we did manage, but the list had all political references expunged, especially those concerning George Bush. Do the high-ups at the ENO peruse each year's list before the run? No, no one peruses my list before it is delivered — the powers that be trust me and support me. Every General Director has given me free rein, and I've been through quite a few now. However this production also travelled to Venice where I got an Italian friend to write a verse for me. With this year's 'little list' in mind, what has caught your eye? Are there any no-go topics? Corbyn has certainly caught my eye, as have other party leaders and, of course, Russian athletes. I have also included a very personal line — Ko-Ko's revenge you might say. Mustn't give too much away but of course there are no-go topics like terrorism, jihadists and Savile. It is a piece of fun after all, and generally I have a secret admiration for the candidates. What do you most enjoy about playing Ko-Ko? Five years ago, I got a delightful letter from a young woman who told me that she had attended my very first performance in December 1988. At the next revival, she was accompanied by her boyfriend who, by the following revival, had become her husband. She wrote that in 2010 they both came again, this time accompanied by their three children. I could not have been more delighted and hope that one day I shall meet them all. This is how we shall encourage young people into the theatre. I have never been able to afford a holiday cottage, but I do not really need one — this wonderful set is my second home. 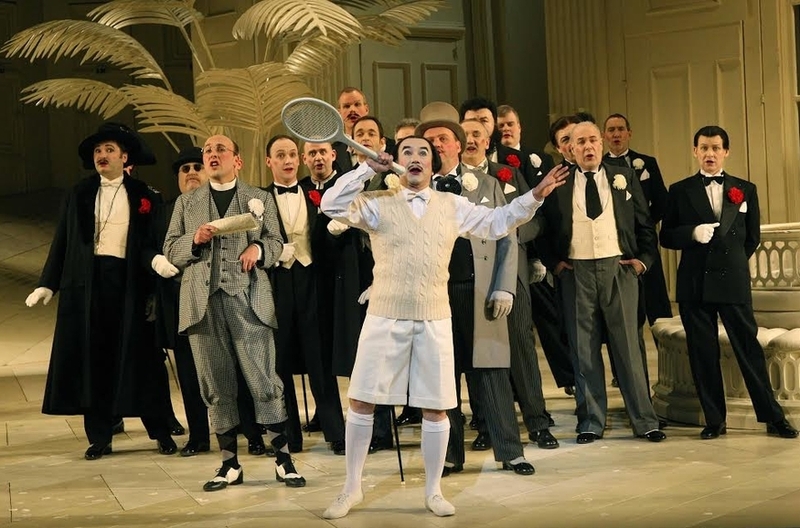 The Mikado opens this Saturday at the Coliseum and continues until 30 January 2016. For a taster, check out the official trailer.